Rafael Nadal heads into the French Open Tennis with his usual confidence, on the back of grinding out a victory in the Italian Open final on Sunday, May 20. Restored as ATP World Number One in the rankings, the Spaniard is a legitimately strong favourite to gain another win in Paris. While he makes obvious appeal, he might be best used as an accumulator selection, with the each-way value of the game's up-and-coming stars, Alexander Zverev and Dominic Thiem, having more appeal in the straight win market. Nadal's record in Paris is impressive. He's already won the tournament a record ten times (2005-2008, 2010-2014 and 2017). It's difficult to doubt he would have won at Roland Garros in 2016, too, if he hadn't been forced to withdraw before the third round with torn tendons in his wrist. 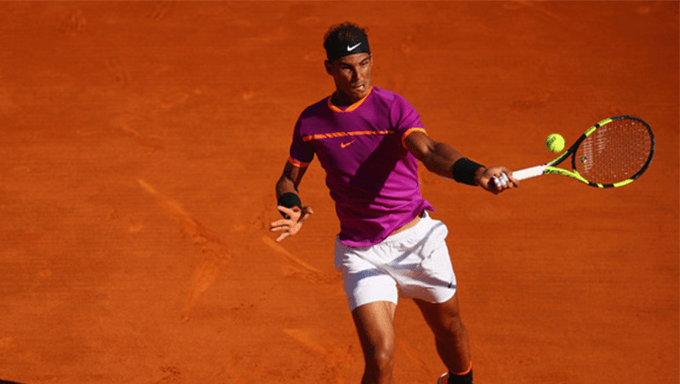 This time around, following his comeback from a hip injury, Nadal has been in impressive form, winning three tournaments and losing in Madrid; it's no surprise that he’s installed as a 4/9 favourite at top tennis betting sites for the Men's French Open Tennis. His form since return from injury has been victory at the Monte-Carlo Masters, the Barcelona Open, losing to Thiem in the quarter finals at the Madrid Open, and victory in the Italian Open. Nadal has a 55-8 record in clay court tournament finals and a 102–2 record in best-of-five-set matches on clay; those losses came in the French Open against Robin Soderling in 2009 and Novak Djokovic in 2015. His five set record on clay also marks him out and gives him another potential advantage, with his famous stamina drawing the sting out of his opponents; his win:loss ratio of 79:2 in Paris says it all. The truth is that Nadal is the likely winner in Paris, but his price is nonetheless off-putting unless you're regularly betting on him and other top players at short prices, in search of a long-term edge. However, he's a solid bet to add to your accumulator slip, if you're putting one together across different sports this summer. Nadal's victory in the Italian Open was another illustration of the player's mental strength, having looked up against it before a rain break took momentum away from the 21-year-old German, Zverev. Whether it was luck or brilliance that saw Nadal take yet another title, there are a line of players under the age of 25 who are starting to gain confidence against the Spaniard, who at 31 is surely going to become increasingly susceptible against younger players. Both Zverev and Thiem are live threats with the ability to win at Roland Garros. The value odds presented to tennis betting enthusiasts on both players make them dutchable in the straight win market, or backable each-way. But if Nadal wins again, at least you should have a winning selection on your accumulator slip. Any player ranked below only Nadal and Federer must have some serious ability – and when you're in that position at just 21 years of age, you're potentially the next tennis superstar. That's precisely where Zverev finds himself. He's played against Nadal five times and has been beaten on each occasion – but there's reason to believe that could soon change. Indeed, in Rome, he lost the first set 1-6 but then took the second by the same scoreline, before losing the final set 3-6. Zverev can break Nadal's serve consistently when in the zone, and the 6'5'' inch German is a live threat. The world number eight isn't out of the French Open equation, partly because he's one of the few players who seems to legitimately give Nadal consistent problems on clay courts. Overall, the pair have clashed nine times (all on clay) and Thiem has won three (a 33% strike-rate against Nadal is none too shabby). In 2018, it's one a piece, with Thiem avenging a convincing defeat in Monte-Carlo, by winning in Madrid (7-5 6-3). Thiem lost to Zverev in the final, but the player has zero fear when playing Nadal. The Austrian had a disappointing Italian Open when crashing out to home-crowd favourite Fabio Fognini, but at 24, he could be ready to show Paris his best. It's hard to truly put anyone off backing Rafa Nadal in the French Open, given his supreme pedigree and form – but his price isn't appealing, with his quarter-final defeat in Madrid illustrating he isn't invincible. The value call is to back Zverev at 9/1 and Thiem at 12/1 with William Hill for the 2018 Men's French Open Tennis title.